What I mean is - when expanding the panels up and down they don't nudge each other up an down, instead they obscure each other. You end up with panels obscured/hidden behind other panels. Can get a bit tricky. It seems the Colour panel is the problem? Looks like a simple enough thing to correct? It does. I pulled the Colour Panel out of the mix and the others seem to behaving sort of* OK.
Trouble is the Colour Panel has gone a bit off. 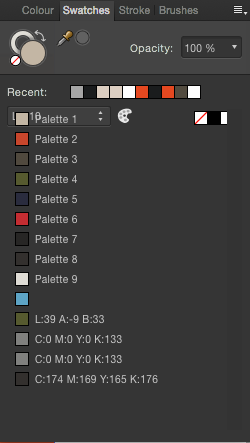 The Palette dropdown has stopped working - looks like it's out of position. Plus the No fill*, Black* and White* fill options are also out of position. I've turned it off and on in the View>Studio menu but fails to reset. That last screenshot looks like some of the auto layout management have gone awry. I assume that if you restart the app, then the colour panel will sort itself out? It does sort itself out on a restart but it's maybe an indication of some underlying problem? Yup. At some point I will have to look at what is going on with our tabs.